"This dessert is light, refreshing, a little tangy, and a little sweet. 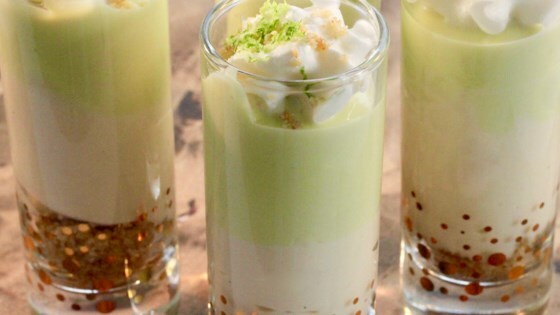 It has the luscious taste of key lime pie with the lovely presentation of a parfait. Everybody has room for a mini dessert, and they're the perfect end to a holiday party or even a sweet finish to a game day get-together. Garnish with whipped cream, grated lime zest, and leftover graham cracker crumbs." Combine graham cracker crumbs, butter, and sugar in a bowl. Add 1 tablespoon of mixture to the bottom of ten 2-ounce shooter glasses. Use an electric mixer to beat cream cheese and yogurt together in a medium-sized bowl until smooth. Set aside. Stir together condensed milk and key lime juice in a separate bowl. Add to the cream cheese mixture, beating until well combined. Divide mixture in half and tint one portion with green food coloring. Place each portion in a separate resealable plastic bag and snip one corner from each. Fill each shooter glass halfway with white mixture. Tap each glass on the counter to level the cheesecake. Repeat with green cheesecake mixture. Place filled glasses in the refrigerator to chill for at least 30 minutes. You can use regular lime juice in place of key lime juice. It was very easy to make. I made it for a luncheon as dessert and it was a hit. Very light and quite tasty. Will make it again soon.